(-)-epigallocatechin is a polyphenol in green tea . 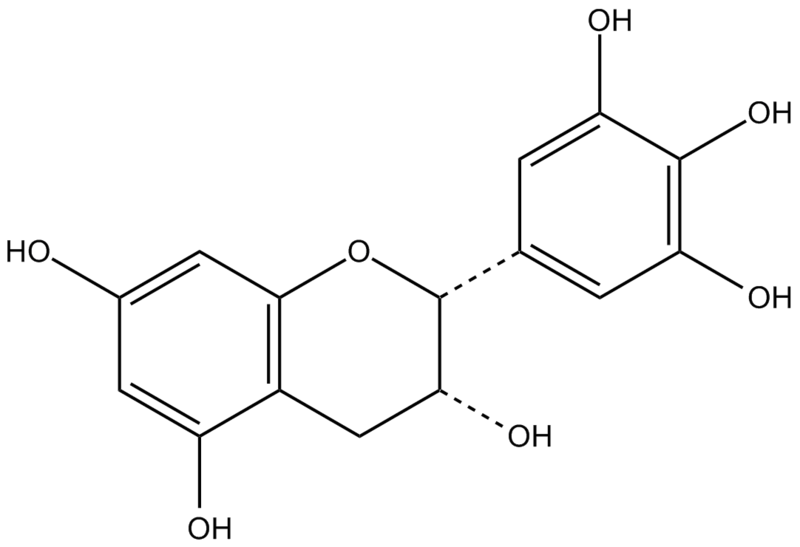 (-)-epigallocatechin (EGC) plays an important role in cell growth inhibition, apoptosis and bone metabolism. (-)-epigallocatechin is a polyphenol in green tea. In MCF-7 and MDA-MB-231 breast cancer cell lines, EGC significantly inhibited cell growth and induced apoptosis, which were independent of p53 and required Fas signaling . In H1299 cells, EGC (10-40 µM) reduced cell viability in a dose dependent way. In Hep-3B cells, EGC (40/80 µM) also reduced cell viability. However, EGC (20 µM) slightly increased cell viabilities in SK-Hep-1 and OECM-1 cells but significantly decreased cell viabilities at concentrations up to 40 µM. EGC exhibited cytotoxicity with IC50 values of 26, 33 and 22 µM in H1299, OECM-1 and SAS cells, respectively. In H1299, OECM-1 and SAS cells, EGC (40 µM) induced apoptosis by 30, 28 and 24%, respectively. In H1299 cells, EGC (40 µM) inhibited hTERT promoter activity in a time- and dose- dependent way and also inhibited hTERT mRNA expression, which was important for cell proliferation . In ICR mice, EGC (0.5 and 1.0 g/kg/d) significantly inhibited platelet aggregation by 18.4% and 25.6% respectively and also significantly prolonged blood clotting time (BCT) and bleeding time (BT), which suggested that the blood anticoagulation and antiplatelet activity of EGC .
. Vergote D, Cren-Olivé C, Chopin V, et al. (-)-Epigallocatechin (EGC) of green tea induces apoptosis of human breast cancer cells but not of their normal counterparts. Breast Cancer Res Treat, 2002, 76(3): 195-201.
. Lin SC, Li WC, Shih JW, et al. The tea polyphenols EGCG and EGC repress mRNA expression of human telomerase reverse transcriptase (hTERT) in carcinoma cells. Cancer Lett, 2006, 236(1): 80-88.
. Chen XQ, Wang XB, Guan RF, et al. Blood anticoagulation and antiplatelet activity of green tea (-)-epigallocatechin (EGC) in mice. Food Funct, 2013, 4(10): 1521-1525.